Celebrate the changing of the seasons with your family, including four-legged members, at Spring Family Fun Day! A variety of free activities with a Snoopy and Peanuts theme are scheduled from 9 a.m. to 1:30 p.m. at Elmhurst City Centre on Saturday, April 7. There will be a free showing of The Peanuts Movie, plus dancing to a DJ, games, prizes and lots of great photo opportunities. At Elmhurst Toyota, we love a community event that gets us outside having fun with our families. We hope to see you there. Start Spring Family Fun Day by heading to the York Theatre to see The Peanuts Movie. Doors open at 9 a.m. and the movie begins at 9:30 a.m. Please note that dogs are not allowed in the theatre. Outside in the plaza, beginning at 10:30 a.m., there will be lots of fun activities to choose from. A live DJ will spin tunes so everyone in the family can get their groove on. Kids can participate in games and win prizes, and there are even treats for your dog. Meet Snoopy and pose for photos with him from 11 a.m. to noon. 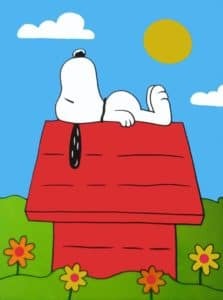 Snoopy doesn’t travel anywhere without his doghouse, which will be out in the plaza, too. Imagine the cute photos and selfies you can take with your family by the big red doghouse. Please be a responsible pet owner by keeping your pets on a leash and cleaning up after them. Clear skies are projected for April 7, so come out and enjoy Spring Family Fun Day at Elmhurst City Centre. April 7, 2018, 9 a.m. to 1:30 p.m. Doors open at the York Theatre at 9 a.m. The Peanuts Movie at the York Theatre begins at 9:30 a.m.
DJ, games, dancing and prizes in the plaza take place at 10:30 a.m. to 1:30 p.m.
Meet Snoopy from 11 a.m. to noon. All Spring Family Fun Day activities are free. Call 630-993-1600 or visit www.elmhurstcitycentre.com.